The classic 35 metre sailing yacht Moonbeam IV has been sold with Mike Horsley at Edmiston & Company acting for the buyer and seller. This fourth, final and largest Moonbeam was designed and built by William Fife Junior in Scotland for Charles Plumptre Johnson, the son of the physician to Queen Victoria. She was first launched in 1914 and commissioned after the Great War in 1920. Owned for many years by Prince Rainier of Monaco, she was a familiar sight all around the Mediterranean, playing host to many famous names. Following this era as a Bermudian Ketch, she suffered a period of neglect until rescued by her then owners in Greece, and later taken to Asia to be given a new lease of life. Thus in 2000 began a new period in this famous yacht’s history. Following a major rebuild, all deck furniture is as original, and the interior layout is very similar to the original Fife design, with a few concessions to modern comforts. Everything from the exotic hardwood interior to the tip of the towering spruce mast was handpicked for beauty, authenticity and functionality. Accommodation is for six guests in three double cabins - all of them en suite- and under power a 335hp Daewoo engine delivers a cruising speed of 8.5 knots. 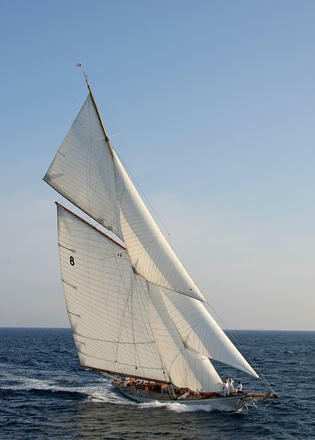 Moonbeam IV was asking €2.5 million.